As someone who does not enjoy (and is allergic to) cigarette smoke, I started thinking about how to use OR to help with the enforcement effort. Let’s say there will be an enforcer (uniformed official) whose job is to walk around campus in search of violators. Based on violation reports submitted by students, faculty and staff, the University can draw a second set of colored dots, say black, on the above map. These black dots represent the non-smoking areas in which violations have been reported most often. For simplicity, let’s call them violation areas, or VAs. In possession of the VA map, what is the enforcer supposed to do? You probably answered “walk around campus visiting each VA”. If you’re now thinking about the Traveling Salesman Problem (TSP), you’re on the right track. The enforcer has to visit each VA and return to his/her starting point. However, this is not quite like a pure TSP. Let me explain why. First of all, unlike the pure TSP, the enforcer has to make multiple passes through the VAs on a single day. Secondly, it’s also likely that some VAs are more popular than others. Therefore, we’d like the enforcer to visit them more often. Finally, we want the multiple visits to each VA to be spread throughout the day. With these considerations in mind, let me define the Smoking Policy Enforcement Problem (SPEP): We are given a set of locations on a map. For each location , let be the minimum number of times the enforcer has to visit during the day, and let be the minimum separation between consecutive visits to location . In other words, each time the enforcer visits , he/she has to visit at least other locations before returning to . The goal is to find a route for the enforcer that satisfies the visitation requirements ( and ) while minimizing the total distance traveled. There are a few minor differences with respect to the SPEP. In the above definition, for every location . What they call is what I call , and they require exactly visits, whereas I require at least visits. I wasn’t aware of this TSP variant and I think it’s a very interesting problem. I’m happy to have found yet another application for it. 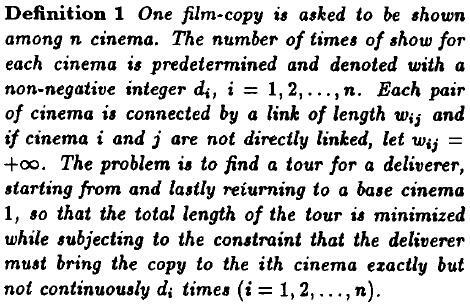 Can you think of other contexts in which this problem appears? Let me know in the comments. INFORMS Optimization Society Conference: Submission Deadline in Four Days! The abstract/poster submission deadline for the Fourth INFORMS Optimization Society Conference is this Friday, January 6! There’s still time to get your abstract in. For information about the conference and submission instructions, check the conference web site at http://bus.miami.edu/ios, as well as this previous post. If you’ve already submitted an abstract, please log into the system and make sure your submission is complete. We now have a tentative schedule online. I’m looking forward to seeing you in Miami in February! Back in September I wrote about the Fourth INFORMS Optimization Society Conference that’s taking place on the University of Miami campus, February 24-26, 2012. Now I’m writing again to remind all of you that the early registration deadline is approaching fast: it’s December 15. Make sure to take advantage of the discount! Moreover, keep in mind that the abstract/poster submission deadline is also close by: January 6, 2012. If you haven’t done so yet, make sure to check out the conference web site: http://bus.miami.edu/ios. The conference is shaping up to be a great event and an amazing opportunity to network with — and present your work to — some of the best minds in the optimization community from all over the world. Even if your work is still in progress, consider submitting an abstract to our poster session; it’s an opportunity to get additional feedback on what you’re doing. In addition, we have an exceptional line-up of plenary and semi-plenary speakers. Finally, since I’ve been building a reputation as someone who likes to talk about food (e.g. here, here, here, here, and here), keep this in mind: your registration fee includes 3 breakfasts, 3 lunches, 2 receptions, and 6 coffee breaks! It doesn’t get any better than this. So, recapitulating, make sure to register before December 15, and send your abstract/poster in by January 6! I hope to see you all here in Miami! Winter Blues Have You Down? Miami in February is Your Town! Want the perfect reason to come to Miami in February? What about the 2012 INFORMS Optimization Society Conference? 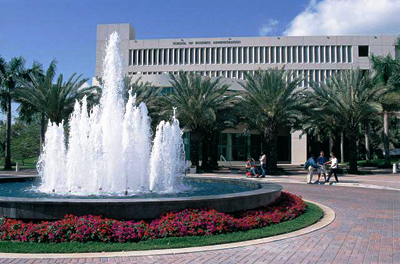 The conference, whose theme is “Optimization and Analytics: New Frontiers in Theory and Practice”, will be hosted by the University of Miami School of Business Administration from Friday, February 24 to Sunday, February 26 on its beautiful campus in Coral Gables, Florida. We are very fortunate to have many of the top researchers in Optimization and Analytics as members of our advisory and program committees. I expect the final conference program to be full of high-quality talks. This is my first time as a member of an organizing committee and I’m happy to say that, despite all the work, it’s been a lot of fun! Here’s a link to the call for abstracts and posters (we’re already accepting submissions). For more information, including important dates, registration rates, plenary speakers, and hotel reservations, visit the conference web site at http://bus.miami.edu/ios, or send me an e-mail (tallys at miami dot edu). I hope to see you all here! The program, which was organized by the School of Business Administration, featured keynote addresses by renowned thought leaders representing some of the world’s most prominent multinational organizations, as well as 17 panel discussions, which also featured prominent business and other leaders. The keynote speakers included Michael L. Ducker, president, International of FedEx Express, Alberto Ibargüen, president and chief executive of the John S. and James L. Knight Foundation, Muhtar Kent, president and CEO of The Coca-Cola Company, Frances Aldrich Sevilla-Sacasa, former president of U.S. Trust, Bank of America Private Wealth Management, Arun Sarin, former CEO of the Vodafone Group, Donna E. Shalala, president of the University of Miami and former U.S. Secretary of Health and Human Services, Jim Skinner, vice chairman and CEO of McDonald’s Corporation, and Jack Welch, former CEO of General Electric Company. The next forum is scheduled for January 2011, and it will focus on health care. The list of keynote speakers is not finalized yet, but judging by the preliminary list that was presented to the faculty during our latest meeting, the line-up of speakers is going to be very impressive. This is a great opportunity for people working on applying O.R. techniques to health care. If you have an idea about how to improve health care management, delivery, allocation, etc., the Global Business Forum is a great place to network. High-profile executives from a number of health-care related organizations from the U.S. and around the world will be just a hand shake away. As an added bonus, the January temperatures in Miami are pretty decent, so make sure to mark that down on your calendars! For the latest updates, visit the School of Business web site every now and then. 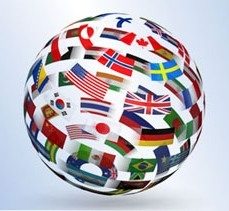 UPDATE (2/28/10): The forum will take place January 12-14, 2011. Registration is now open (early registration discount ends June 15). UPDATE (9/13/09): It looks like someone has already studied a very similar (or even the same) problem. Like many other universities, the University of Miami has a number of emergency phones spread all over its campus. They are called blue-light phones because of the (you guessed it) blue light that turns on right above them at night. 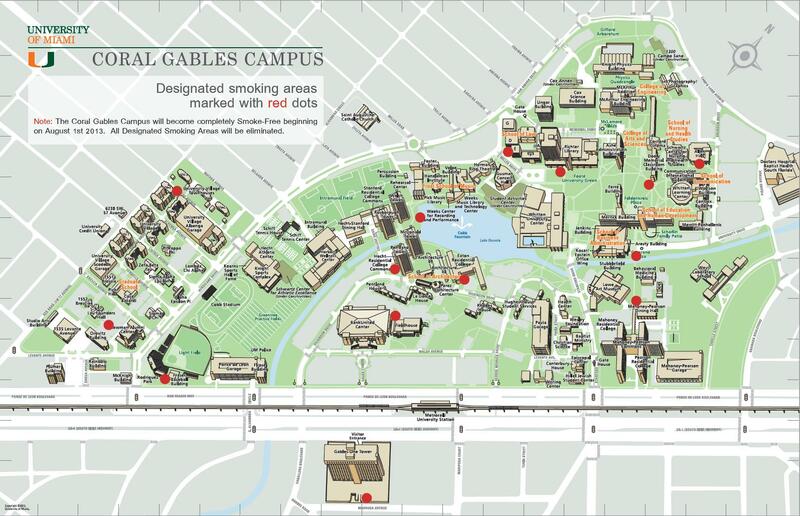 Here’s a map of the phone locations on campus. Now consider the following “facility” (or resource) location problem inspired by the blue-light phones: given a street map, including building locations, we want to place “facilities” along the streets so that, no matter where you are on the map, (i) you can always see at least one facility, and (ii) the facility closest to your location is never more than L feet away. The objective is to satisfy the two conditions above while minimizing the number of facilities to install. In our case, we can assume that the dimensions of the facility/resource are negligible. It’s not hard to imagine other application domains where this problem would be relevant. This is an interesting modeling exercise. One may be tempted to discretize the space and only consider a finite number of possible facility locations. However, I believe you should allow the facilities to be placed anywhere (i.e. use continuous variables) within each one-dimensional street segment, which apparently makes it harder to model. I think the placement of UM’s blue-light phones could be greatly improved. It certainly violates condition (i) which, in my opinion, is crucial. Anyone interested in giving this problem a shot? It would certainly be a very interesting undergraduate research project (graduate as well, depending on how far you want to go).